Like many practices, Swedesboro Animal Hospital recognized the future of veterinary record keeping is in eliminating paper. The challenges they faced in making that transition was to not have the staff slowing down, still meeting the demands of a multi-disciplinary practice in areas such as integration and task management, and doing so in a way that allows for future growth. 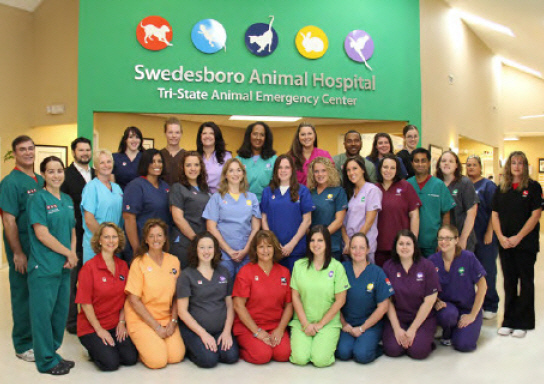 Swedesboro Animal Hospital, and its sister hospital Tri-State Animal Emergency Center, is an 8-doctor, full-service 24-hour practice in southern New Jersey. The practice was recently selected as a Top 5 Finalist for AAHA’s Practice of the Year in 2012. Founded in 1986, the hospital has grown from a tiny, single-room building into a modern, sprawling facility that now encompasses seven exam rooms, two surgical suites, and Divisions of Emergency and Critical Care, Oncology, Rehabilitation and Pain Management, and Surgery. Swedesboro Animal Hospital and Tri-State Animal Emergency Center are helmed by Dr. Mark Magazu, Chairman and Medical Director, who has more than a quarter century experience working with small animals. Dr. Magazu’s son, Mark, Jr., a graduate of Columbia University and Georgetown University Law Center, is Hospital Director, responsible for the overall growth and management of one of the region’s largest hospitals. 1. Full integration of the practice – The ability to call up radiographs, ultrasounds and patient files not only throughout the practice, but on iPads and laptops outside the practice. 2. No Paper! – Paper was overrunning the practice — and slowing it down. The costs were out of hand, and management of tens of thousands of paper files was consuming not just time, but entire rooms for storage. VIA allowed us to go paperless within one month of installation. 3. Ability to run multiple business centers – All of which need their own ‘engines’ to grow as well as to maintain order and organization. Doing so through VIA, allows Swedesboro to keep transactions separate and organized, as well as to run critical reports to ensure growth, compliance, and a streamlined inventory system. To help with that transition, some of the surgeons utilize voice recognition software allowing them to simply dictate their medical notes directly in to the patient file located in VIA. Finally, any issues that we’ve faced regarding VIA’s implementation have generally been handled swiftly and with success. How has VIA Helped Our Practice?